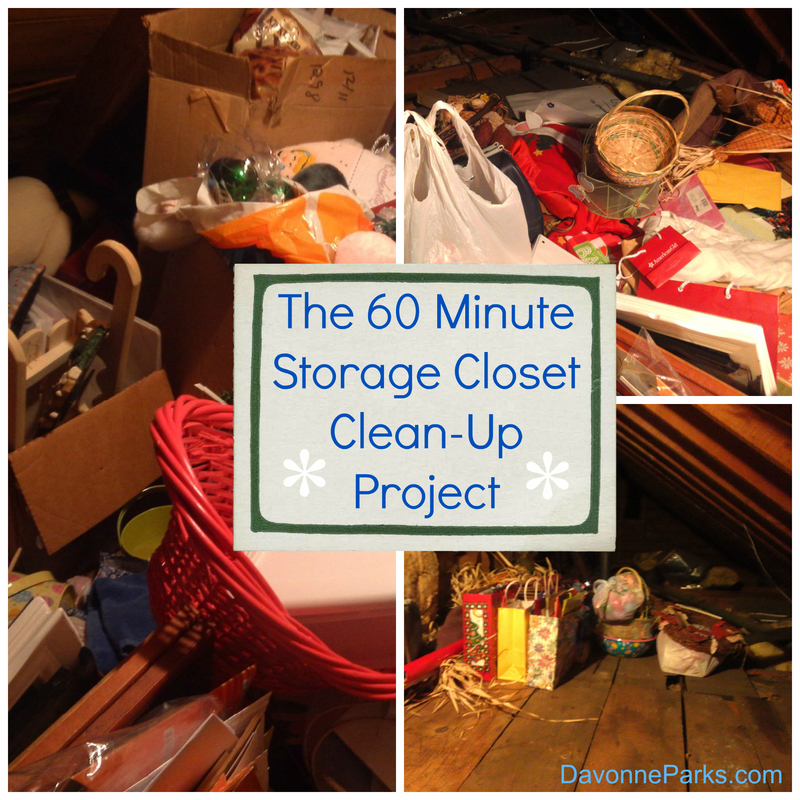 I dreaded the idea of cleaning out my storage closets so much that I saved them for nearly last when I did my giant de-clutter project. When I finally got down to business and cleaned out those closets, however, I was pleasantly surprised to discover the job was much easier than I’d expected. In fact, it only took me one hour to clean out my holiday storage closet. C. I realized that if we hadn’t needed something in the two years it had been buried under clutter, then it was safe to let it go. Since this closet was a holiday closet, the organization was easy. A box for autumn things, a basket for Easter items, a bag with Valentine decorations, and a couple of gift bags stuffed with gift wrap supplies. Regardless of the types of things you have in your storage closet, grouping like items together is a must for efficient organization. 2) Toss as you go. The only exception to a donation bag is if your item is a family heirloom – ask your relatives if they’d like to have the item before you donate it elsewhere. When you come to a difficult section of your closet, don’t organize all of it. Just throw like-items in a box or a pile and move on. For example, I did awesome with our entire holiday storage closet until it was time to go through the Christmas decorations. That overwhelmed me. My solution was shoving all of my Christmas decorations to one side of the closet. This method can be used for other items as well – whether you’re overwhelmed by photos, baby clothes, or something else, instead of feeling a need to organize every single item you own, just group some items into a box or two (or twenty) and place the boxes neatly in a closet. They’ll be there waiting for you when you’re ready. As far as our Christmas items were concerned, we decided to drag the entire Christmas pile to our living room when it was time to decorate for Christmas. With the exception of two special items, whatever wasn’t used to decorate with went directly to Good Will. 4) Don’t worry about making everything look amazing. Of course, pretty bins and boxes are fun and nice but they don’t actually organize your stuff for you. Just make your items functional for now and consider the job done. If you ever want to make things pretty later, everything will already be ready to go. How are you doing with decluttering? Leave a comment or send me an e-mail to let me know!